Most garden railroaders use track power, so their trains don't run as well if the track gets dirty or oxidizes. My friends who use only battery power chide me because I have to wipe my right-of-way clean every few months to keep my trains running smoothly. That said, when I "clean my track," 80% of what I'm doing is clearing away weeds and invasive groundcovers, or wiping off sticky stuff from my evergreens or some such - things that battery users have to do anyway. The track cleaning part is quite easy, at least in the areas where I can easily reach the track. And that part is a design issue - not a maintenance issue. That said, there are a number of different approaches to track cleaning, which can confuse the beginner, so here's an overview. If you've clicked onto this article because you have a crisis, bookmark it so you can read the details later, but here's the very short version of what it says. Clean the top and inside edge of each rail. The first time you run a train, you'll notice some hesitation in a couple places. Usually there was something you didn't see the first time around like pine sap, but an extra effort on that section will usually do it. When you're done running your trains today, and you want to learn more about how to minimize track cleaning in the future, come back and read the rest of the article. Brass and aluminum rail can get a layer of light oxidation (where a film of copper oxide or aluminum oxide forms on the rail heads and diminishes conductivity). But all track gets gunk on it. People who run track powered trains notice oxidation and gunk buildup much sooner, because their trains don't run as well. In fact, people who run battery-only trains or who have stainless steel rails never have to worry about oxidation on the track. But everybody gets gunk on their track. The biggest source of gunk on most garden railroads is the black powder deposited by the plastic wheels on out-of-the-box rolling stock. Outside on hot, sunny days, the track can get hot enough to convert that powder to an oily gue that makes things even worse. Folks who go to all metal wheels on their trains often find that it reduces their track maintenance hassles by half or more (in my case it was more like 75%). Tree gunk is a second problem. In some cases, it's a close second. Evergreen sap is the worst - a good reason not to have too many conifers overhanging your track, even if like me, you have them everywhere else. But certain deciduous trees, including most nut trees, cast an oily film on anything beneath their leaves. You've noticed it on your car if you've parked under a walnut tree during certain times of the year. One reader had such a problem on his track that he had to wipe the track clean every time he ran. (After trying to track down the cause the the problem, he admitted that his tree got his automobile gooey, too). Weed juice is another problem. If, say, a blade of grass is growing over the track, your train may run over it just fine. But it might smash the juice out of the grass onto the track and create a tiny "dead zone" that affects small locomotives without many power pickup wheels. This and other tiny localized problems like smashed insects, bird poo, and slug and ant trails are the reasons I keep my cleaning materials onhand during operating sessions - a moment's cleanup can save the day. Twigs, leaves, overgrown ground cover, and other physical obstacles - No, you don't need cleaning materials to get rid of these, but when I clean my track, I usually spend more time clearing away such obstacles than I do actually cleaning the rails. Please read this whole section before you charge out into the yard. How you clean your track depend in part on what kind of gunk you have on your track and in part on what kind of rail you have. For example, if you have stainless steel rails, concentrate on chemical, not abrasive cleaning. Cleaning Track Gunk - Fortunately, most track gunk responds quickly to anything with a light oil base, from lamp oil to kerosene. Ironically, the formula of lamp oil that garden train manufacturers sell for "smoke fluid" works great on track, so lots of folks who never put smoke fluid in their locomotives buy it just for track cleaning. Of course it costs several times as much as "generic" lamp oil - the kind you find in department stores around the holidays - so I'm a big propoponent of trying the cheap stuff first. Most garden railroaders use old cotton rags to apply the fluid. But if you have brass or aluminum track and an oxidation problem, you may want to try using Scotch Brite pads (below). If you choose a chemical solution, wear protective goves and don't have a bonfire going nearby. Cleaning Oxidation - If you use a chemical like smoke fluid frequently, it will even help with minor oxidation problems. This is why chemical track cleaning is used almost exclusively on indoor railroads, where oxidation is usually less of a problem. That said, most approaches to cleaning oxidation off of the track will also get rid of track gunk (unless you have an excessive amount of gunk from plastic wheels or nut trees, in which a combination of methods may be necessary). If oxidation is a big problem for you, you'll probably need to use something mildly abrasive on the track. LGB makes a track cleaning pad unit that has a nice grip and does a nice job. The pads themselves are replaceable, too. Notice that it is rigid and the photo shows it being used to clean only the top surface of the rail. Lots of newbies get that top surface nice and shiny, but their train still stalls, especially on curves. That's because wheels also pick up electricity from the inside edge of the rail - especially on curves. So if you get one of these, don't imagine that skating it across the top of the rails like they show in the photos will do the whole job. Try holding it diagonally as you work, with one corner pointing down a bit. That way, you can get at least part of the inside edge of the rail head in the same pass. Some folks use "Scotch Brite" pads. These are cheap, flexible, and widely available. If the track is very bad, you can even use them with a chemical cleaner. Their abrasive power is relatively low - it is difficult to damage the track with these. On the other hand, if oxidation is your biggest problem you might want something that is a tad more abrasive. I use the little sanding sponges that you can buy in the paint department. I like those because they are flexible and relatively inexpensive. If the track is not too bad, I can swipe a whole section of track quickly. I hold it diagonally, with the tip pointed downward a little. That way the sponge flexes enough to get the top and inside edge of both rail heads in the same pass. If the track is really bad, I still find the flexibility helpful. And because they only cost a few dollars each, I can leave several out around the railroad (usually under buildings) for quick access if a section of track suddenly gets glitchy because of a squashed bug or something. Some folks think I shouldn't use these because they're more abrasive than some other solutions, but since I only really clean my track once or twice a season, my rails will outlast me regardless . . . . Some folks with ground-level railroads have invested in drywall sanding solutions like the one shown to the right. Rubbermaid also makes one. You attach the sanding pad to the "mop-head"-shaped thingie, screw it onto a mop handle, and clean your track without ever bending over. You'll have to use something else to clean turnouts (switches), crossovers, and rerailers, but you get the idea. Some folks who do 80% of their track cleaning by hand use something like this in their tunnels or other hard-to reach spots (where you wouldn't have turnouts anyway). Since my railroad is mostly raised, and the part that is on the ground goes under bridges and trees, this sort of thing doesn't really work for me, but it works great for some friends. Note: When shopping for abrasive materials to clean your track, get the finest grit you can. If you use too large a grit, the little grooves it causes in the track will actually attract gunk and hasten oxidation the next time around. Some folks who have a lot of track to clean or who run trains all the time, want a simpler, faster way to get the track clean. The most common of these is a track cleaning car, like that made by AristoCraft. A little replaceable abrasive pad hangs down from the middle of a somewhat weighted bobber (4-wheel) work caboose, scraping the top of the rail heads clean as the train goes around the track. As you can probably imagine, it does the top of the rails pretty well, but not the inside edges - otherwise it would hang on more turnouts, crossovers, and rerailer/grade crossings than it does. Still, a lot of folks like to start out each session by having a locomotive drag one of these around the railroad a few of times, just to skim off any minor oxidation, tree groop, or plant or bug juice off of the track before running the "real" trains. Other folks who have let things get really "out of hand" like to keep one battery-powered locomotive on hand to drag one of these around and around the railroad until the top of the rail shines. It's not a total solution, of course - you will still probably have to get the inside edge of the rails on curves and turnouts yourself. But it helps, especially if you have a very long mainline. And it doesn't cost any more than the average boxcar, so you don't have to lay out a ton of money to see if it works for you. LGB has also made a track cleaning pad (#5005) that would attach to the bottom of four-wheeled LGB cars and work about the same. I haven't any experience with it, but most folks seem to think it's similar to using the Aristocraft Track Cleaning Car. If you're an LGB user, this might be a good approach for you. The most elaborate "automatic" solution I've seen is the LGB track cleaning locomotive. This is a powered unit that has powered abrasive wheels that actually buff the track. It is no longer manufactured, ands it wasn't cheap when it was made. But it was popular with museums, zoos, and amusement parks that had trains running several hours a day most days of the season (or year, if indoors). Folks with arthritis or other things that make it hard for them to clean the track manually love this solution as well. Folks have also made all kinds of home-made solutions. For example, covering a wooden block with drywall screen or a Scotch Brite pad, weighting it, and dragging it behind or under a car. Or, for a non-abrasive chemical approach, using a thick rigid felt pad dabbed with lamp oil . . . . Your mileage on all of these options will vary, of course. 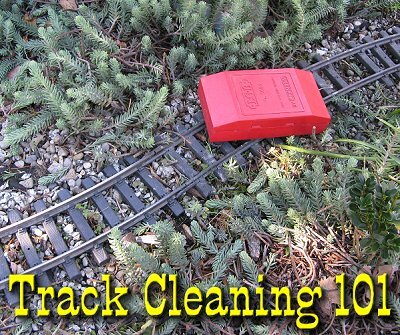 The truth is, track cleaning is relatively easy however you do it, and you shouldn't let anything in this article scare you off from building or (worse yet) maintaining your garden railroad. Most of the materials and methods are either very inexpensive or relatively inexpensive, so you should experiment until you find an approach or combination of approaches that works for you.